Industry-leading efficiency in a low maintenance package. Certified to deliver ISO 8573-1 Class 0, 100% oil-free air, FS-Elliott’s air compressors are ideal for industries such as food and beverage, pharmaceuticals, electronics, automotive and others that require unpolluted environments. Benefits of using oil-free air in the manufacturing process include eliminating contamination throughout the plant, resulting in prolonged equipment life, and lowering downstream filtration requirements and pressure drops. All Polaris+® air compressors are backed by FS-Elliott’s standard, comprehensive 2-year warranty. For added coverage, SteadiAIR 5 is available for eligible Polaris+ units when the factory recommended standard maintenance and operation guidelines are followed and the compressor is serviced by an authorized FS-Elliott service provider. SteadiAIR 5 extends the standard warranty on the airend assembly, providing coverage for a full five years from the date of delivery. Contact your FS-Elliott distributor or representative for full eligibility requirements. FS-Elliott compressors are designed to be easy to install, operate and maintain, allowing our customers to focus more on their business and less on their compressed air system. For many customers, worry-free air is the primary reason they select FS-Elliott for producing their compressed air. 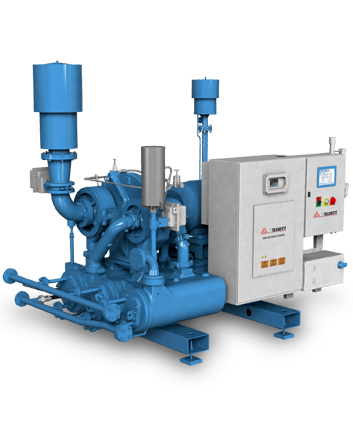 Employing an energy-efficient compressor is critical to minimizing operating costs. By offering superior operating life-cycle costs compared to reciprocating, rotary screw or positive displacement compressors, Polaris+ compressors allow customers to realize immediate energy savings and quickly gain their return on investment. By specializing in compressed air technology, FS-Elliott has been at the forefront of air compressor design and engineering, incorporating the latest aerodynamic and control system technologies to ensure optimum performance. Over 50 years of experience enables us to deliver reliable, energy efficient air compressors with the lowest cost of ownership of any compressor on the market today. FS-Elliott’s Polaris+® industrial air compressor series combines over 50 years of operational and design experience in an extremely reliable, energy efficient, cost-effective package. They suit a broad range of applications, with models ranging from 250 hp to 3,000 hp in two and three-stage configurations that deliver up to 150 psig (10.5 barg) discharge pressure. For additional information, please select from one of the models below or view our Polaris+ brochure. The flexibility of FS-Elliott's Polaris+ compressor series makes them ideal for a wide range of applications. Centrifugal air compressors for the electronics industry.